As you are probably aware, HDfury4 is capable of outputting Digital or Analog video (or both at the same time!) in either 2D or 3D and up to 720p144 or up to 1080p72. This high frequency setting (Frame Rate Control) can be combined with the HDfury4 Stream Control. Said otherwise, when beaming from 2 projectors, you can go up to 720p240/720p288 and or 1080p120/1080p144! The Stream Control is powerful and could be used in many differents ways. 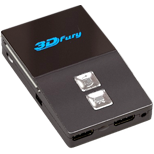 For example, a single HDfury4, fed with 3D content and set to Left or Right frame is able to convert 3D content into 2D in case you would like to watch 3D only content in 2D. If you wish to use the HDfury4 in a dual 2D/3D projector setup (or wish to convert 3D into just the left or right stream) you will need two HDfury4′s. One set for Left stream and one set for Right stream. By default they come shipped with the button in the center position for single projector use.